Custom Pet ID Tag deals feature 2-for-1 pricing and lifetime guarantee. The Holiday Sale from Dog Tag Art features every pet id tag at dogtagart.com at a special 2-for-1 price. To celebrate the holiday season, Dog Tag Art customers can enjoy special savings on pet id tags from November 29 to December 2. 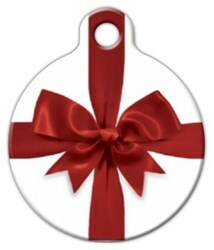 The Holiday Sale from Dog Tag Art features every pet id tag at dogtagart.com at a special 2-for-1 price. Each pet ID tag from Dog Tag Art is made in the USA from recycled steel and guaranteed for life. Whether it's a custom tag or a professionally designed tag, Dog Tag Art has something for everyone and their furry friends. Dog Tag Art's ‘Custom Tag Creator’ allows anyone to purchase a one-of-a-kind self-made ID tag. More information and pricing for Dog Tag Art’s Holiday Sale of custom pet id tags can be found at DogTagArt.com. Dog Tag Art makes high-quality personalized pet ID tags featuring a sturdy recycled steel core and permanent graphics. Customers can go to dogtagart.com to design their own one-of-a-kind tags using custom text, personal photos or imagery, or select from hundreds of artist-submitted tag designs. Dog Tag Art tags can be used to creatively commemorate special occasions, including engagements, weddings, anniversaries, birthdays, reunions, and other celebrations. Dog Tag Art has been featured on Regis and Kelly, as well as in The New York Post, Dog Fancy, and in several other publications.